What Does it Take to Return? I am a writer. Lots of times I write because I need to get something out of my system. Today I am not even sure this article will make it onto the website. I am not sure, because I am angry. I am not only angry, I am discouraged, sad, and confused on how to make sense of the horrible news that Gilad, Naftali, and Eyal are dead. I confess to being angry, not only at the senseless deaths of these three teens in Israel, but I am angry at the Father. Didn’t He see all the people coming together in Jerusalem to pray for their safe return? Didn’t he hear our prayers as we all stopped what we were doing to pray in solidarity with them at 3 PM last week? Didn’t He Hear us? Why are these three teens dead and their families devastated? What do things like this do to lift us up? How do they lift Him up? I don’t like to be angry at my Father, but, I just can’t seem to help it. We did what we were supposed to do, didn’t we? Didn’t we all cry out to Him to intervene? How many innocent lives have to be lost before He hears and does something? So, I was looking for a verse, and instead of finding the one I thought I wanted, I found this letter to the Corinthians. He speaks of a test. What kind of test is this? Is it one that shakes our faith? 2Co 13:5 Keep examining yourselves to see whether you are continuing in the faith. Test yourselves! You know, don’t you, that Jesus the Messiah lives in you? Could it be that you are failing the test? 2Co 7:8 If I made you sad with my letter, I do not regret it, although I did regret it then. I see that the letter caused you sorrow, though only for a while. 9 Now I am happy, not because you had such sorrow, but because your sorrow led you to repent. For you were sorry in a godly way, and so you were not hurt by us in any way. 10 For having sorrow in a godly way results in repentance that leads to salvation and leaves no regrets. I can definitely relate to the end of that verse. It seems like everywhere, every day we have more sorrow heaped upon us as we read and see pictures of the deaths of others. And, today, I am feeling the sorrow of a world that produces the death of three young men. So, today, I am wrestling with God. I am seeking to understand what the purpose of this event has for me and for the world itself. Somehow, we must find a resolution to this conflict. I am not speaking of the conflict in the Middle East, I am speaking of the conflict we have between ourselves and God Himself. We turn to Him in times of great darkness. It is hard to imagine greater darkness than when life is held so cheaply that innocent young men are killed. Yet, I am reminded that there is greater darkness to come. What is the purpose of it all? Perhaps the first sentence of the paragraph above is our answer. We turned to Him in a time of darkness. And, while I truly believe in the sincerity of everyone who spoke a prayer to our Father to intervene on behalf of these teens, was it enough? Are we really qualified to ask Him for anything? Why was the Father silent? Was it because there was a greater purpose? Sometimes the answer is not what we want. Yeshua, who is more qualified than any of us will ever be, was still met with silence. He didn’t want to hear there was no reprieve, but he accepted it. He bowed to the will of the Father. I don’t think I am saying that it is YHVH’s fault that the teens were killed. I really don’t know the answer to that. But, can we find a purpose? The larger question that I am asking is why didn’t He demonstrate His power and might in this case? I believe that He is the Creator of the Universe! He parted the Red Sea! He defeated Death! I remember when 9/11 happened. It seemed like everyone was on their knees, flooding into churches, joining hands and singing God Bless America! What were we supposed to learn from that event? If three thousand deaths at the hand of terrorists could not accomplish a lasting unity, why do I think the death of three young men in Israel will do more? We have read this a lot. But what is it really saying? Is it enough to humble ourselves? Is it enough to pray? I think we figured out those two things, at least in part. 2Co 12:20 I am afraid that I may come and somehow find you not as I want to find you, and that you may find me not as you want to find me. Perhaps there will be quarreling, jealousy, anger, selfishness, slander, gossip, arrogance, and disorderly conduct. 21 I am afraid that when I come my God may again humble me before you and that I may have to grieve over many who formerly lived in sin and have not repented of their impurity, sexual immorality, and promiscuity that they once practiced. 2Co 6:17 Therefore, “Get away from them and separate yourselves from them,” declares the Lord, “and don’t touch anything unclean. Then I will welcome you. 18 I will be your Father, and you will be my sons and daughters,” declares the Lord Almighty. COULD IT BE THAT WE ARE FAILING THE TEST? Pro 28:9 If one turns away his ear from hearing the law, even his prayer is an abomination. Isn’t that what Paul said? There are conditions that need to be met for Him to hear us! We are told to put off the old man. We are told to die to ourselves and live in Yeshua. We are told to Listen and Obey (Shema). Are we there yet? Are we really walking in the spirit, or are we too attached to the world? Paul wrote to the Corinthians! He urged them to get in touch with HIM! 2Co 5:4 So while we are still in this tent [physical body], we sigh under our burdens, because we do not want to put it off but to put it on, so that our dying bodies may be swallowed up by life. Instead we need to be swallowed up by His spirit. We need to listen to the song of Elijah: Repent and Return. Only when we can put off the old man, and put on righteousness will He hear from Heaven and heal our land. May we hear what He is trying to tell us! 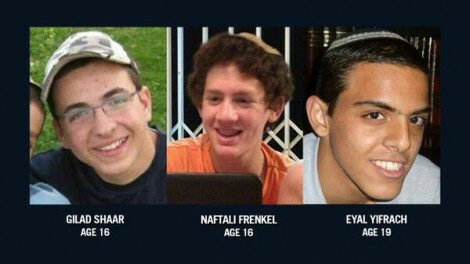 May the deaths of three young men named Gilal, Naftali and Eyal cause a revival among us to return to Him. May we truly Repent and Return to His way! May we see and build unity and reconciliation between the House of Judah and the House of Israel! May what the terrorists designed for evil be turned to good for the glory of YHVH! Please, Father, do not let their deaths be in vain. Amen.